He lived in Chicago with his wife, Melissa. Years ago, when he resided in North Jersey and in Philadelphia, Pollotta was a force in the Philadelphia in ’86 Worldcon bid. He helped publicize it with a series of comedy tape recordings about Phil A. Delphia, fannish Secret Agent 86, played at conventions around the country. Indeed, he had recently created a series of YouTube videos from the old sketches, adding images to the scratchy soundtracks. 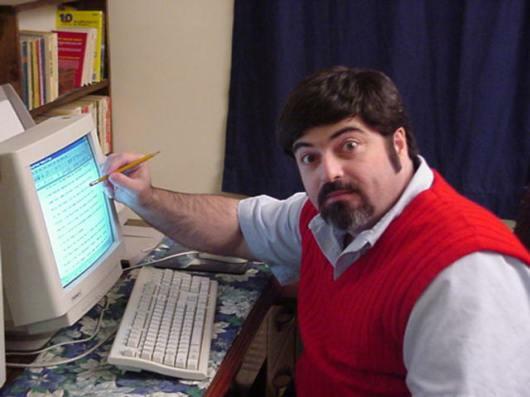 Pollotta was a guest of honor at Capclave in 2004 and Capricon 26 in 2006. This entry was posted in In Passing, Worldcon and tagged Philadelphia in '86 by Mike Glyer. Bookmark the permalink. I’m sorry to hear this. I never met Polotta, but I remember ILLEGAL ALIENS making even grumpy old me laugh out loud in spots. Met a few times, enjoyed the engaging company, but have not read his work. Recently, I seriously bashed my knee and was going to post on FB and elsewhere about what I waa going though. Not after this. The left handed compliments from the powers that be only make me determined to see more days ahead with less grumbling.